When a triad is not in root position, the root is always the upper note of the interval of a 4th???!!!??? They're talking about triads in closed positions - where all three notes are as close as they can be to each other. In root position, A minor is A C E - containing two intervals of thirds - A>C = m3; C>E = M3. Move to 1st inversion, C E A, the C>E =M3, but the upper note (root note of A) is P4 above E. E>A =P4. Move to 2nd inversion, E A C, the root (A) is still P4 above the note below it. E>A = P4. A>C = m3. It's a strange way to say something like this, but looking at it written on a staff, any triad will have all 3 dots on consecutive lines/spaces in root position, whereas in 1st or 2nd inversion, there'll be 2 notes on consecutive lines/spaces, and the other will be on the opposite (space/line). That gives the P4 interval, and the upper note will be the root. I'd question the V triad always being major. Usually, yes, but there are pieces out there where it's v, and they still work. True, the leading note is more convincing a semitone below the root, but it's not always the case. Maybe at beginner level it's simpler to state this? Not only true for minor, but also major triads. If we fill the piano keyboard with C major triads, we can see that there are two kinds of gaps between the notes. Small gaps called "thirds", and large gaps called "fourths". No matter which "inversion", i.e. set of three consecutive notes, C-E-G, E-G-C or G-C-E you select, the root note C is always on the right side of the large gap. The same applies to all triads, because triads consist of thirds... I mean small gaps stacked on top of a root note. Starting from the root position, you take steps: small, small, large, small, small, large, small, small, large ... Always after a LARGE jump, you know you're at a root note. If you jump along the gaps, and if you don't start with "small, small", then you know you didn't start from the root. The language used when talking about music theory sometimes makes things seem more complicated than they need to be. "When a triad is not in root position, the ROOT is ALWAYS the upper note of the interval of a 4th!" ... could anyone possibly come up with a more difficult way to say it? ;) (joke) From the animation above, it should be pretty clearly seen that the root note C stays on the right side of the LARGE interval, regardless of where the window slides. Such a rule of thumb might be useful to point out, if it so happens that a student practices writing these inversions and playing them on an instrument, but still fails to recognize the (in my opinion, fairly obvious) pattern or that it can be used for quickly seeing where the root note is. I think it's a very simple thing, and the only thing that makes it difficult to understand is the wording. Personally, I would recommend teaching music theory only after the students have had at least some kind of practical use for the things being conceptualized. Otherwise it's like giving a solution without a problem, answer without a question. Yes, it is! Try it out and play it, you will find it out. This is not primarily a rule or a law, it's probably a help for beginners to determine the root. As the thirds are always noted on a line or between, so you can easily define the root tone, as it's the one that's a fourth above. if you play the triads I-V-I and I-IV-V and the cadence I-IV-V-I and later you will see that it is with all triads of all steps the same. It may be difficult to see through the problem just by reading in a book, but it will become clearer by playing on the keyboard and writing it by yourself, you'll see. A chord consisting of three notes is called a triad. Triads can be constructed from every scale using the same formula. The triads constructed from a scale are called primary triads and in the root position. The notes in a triad are numbered according to their position in the scale, not the triad. Thus, in the triad ACE the notes are A=1 C=3 and E=5. The triad CAE uses the same notes, so the numbering is still C=3, A=1, and E=5. A triad progression is two or more arbitary triads played in some sequence. Each triad typically follows the previous within the same octave, although the progression can ultimately move up or down several octaves. Notes actually name a class of pitch intervals an octave apart. So the A note actually represents all pitches from octave zero, or A0, A1, A2, ..., to An, where n is any integer, usually eight. In a triad, the notes are ordered in ascending pitch, the lowest called the root note, but without specifying their octave. It is possible to pick an octave for each note and that would still be a triad. For example, the triad ACE could be A2 C5 E7. 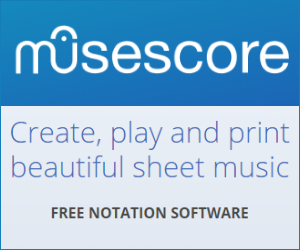 This arbitary assignment is not precise enough, so we need to provide methods for allocating octaves to the notes. Put simply, the article is explaining how to assign a specific octave to a note with respect to other note octaves in the triad. Or, how to reorder notes in a triad and what to call them. Okay so the root typically means the lowest note in a triad. 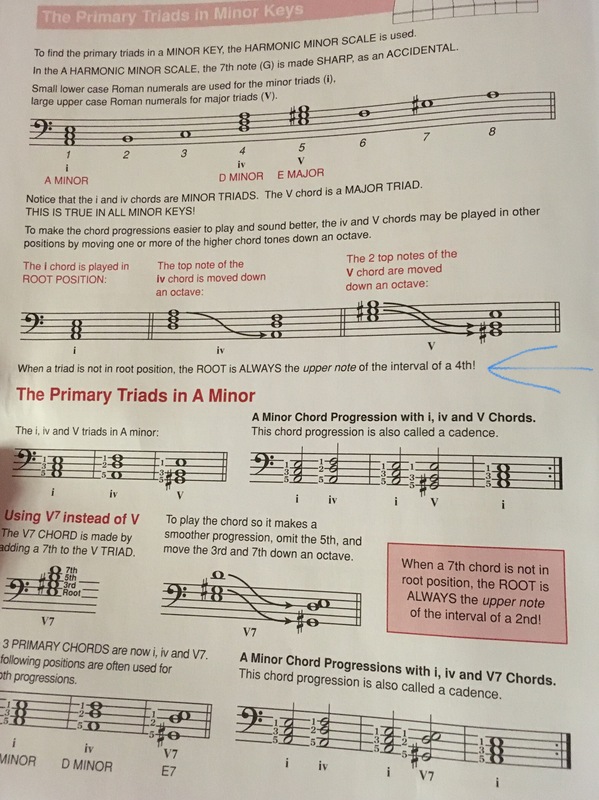 However, the article explains these notes are actually moved up an octave (A2 to A3 for A Harmonic Minor), so they're at a higher pitch than the other two notes in the triad. They are still called the root note (A), even though they are not in the root position (A2). The triad is inverted because the root defines the triad orientation and is now above the other notes (A3) and not below them (A2) as a root normally is. Often, moving from one chord to the next raises or lowers the overall pitch too much (or not enough). To change that, the notes in either triad are reordered so the new root notes are a (semi-)tone apart. Instead of playing the i and V chords in root position (ACE and EG#B) the V can be reordered to G#BE so the root note change is now A to G#, rather than the jump A to E. Also, both triads have an upper E, which can be suspended (held) between the triads, giving a smoother transition down from AC to G#B. Similarly, the i chord can be reordered to EAC, so now the i and V share the same root, and the chord change actually lowers the pitch from AC to G#B, while maintaining the same root. The main idea is to keep control on pitch during chord progression and also develop a flow from one note in a chord to the next. The actual position (relative pitch) of each note in the chord is given an inversion number. The first inversion is the root position with the root above the other two notes. If this makes sense, you should be able to follow the article without difficulty. Not the answer you're looking for? Browse other questions tagged theory chords or ask your own question. I need help understanding the concept of chord inversions. How do I own the music? Why is the third triad dominant? Sight reading chords—pay attention to bass, treble, or none of the above? Does chord type(major or minor) remains the same for common chord progressions irrespective of any mode or scale?